The first panel discussion, “Re-imagining Civil Discourse,” was moderated by Robin Wagner-Pacifici, the Gil and Frank Mustin Professor of Sociology. Edley believes the responsibility for creating civility lies in a citizen-created, popularly enforced code of discourse. “Recognize that a disposition toward truth-seeking is a civic virtue to be taught, cherished, celebrated, and demanded,” he told the audience. “Be self-conscious about building institutions that are guardians of civility”—including, he said, institutions of higher education. William Saletan ’87, national correspondent for the online magazine Slate, agreed that “you have to engage people whose premises differ from your own so you can persuade them.” But he also pointed out that although the “inter” nature of the Internet offers possibilities for the cross-pollination of ideas, too often we end up segregating ourselves along ideological lines. “Some bloggers called it ‘epistemic closure,’” said Saletan, which means “confining yourself to a mutually reinforcing network of partisan commentators and news sources.” This happens on both the right and the left, he added. The Internet may fragment audiences, but it also allows them to talk back, said Andrew Perrin ’93, associate professor of sociology at the University of North Carolina–Chapel Hill and author of Citizen Speak: The Democratic Imagination in American Life (University of Chicago, 2006). “Political participation is a good in itself.” He said that’s true even if the information “is hopelessly irresponsible,” which he admitted occurs regularly with certain popular commentators. Symposia were held during inauguration weekend. Alternating between reasons for optimism and reasons for concern about civil discourse in America, Perrin cited some eyebrow-raising statistics from recent polls: 57 percent of Republican voters believe Barack Obama is a Muslim, 45 percent believe he was not born in the United States, 34 percent compare what he’s doing to what Hitler did, and 24 percent of Republicans think he might be the Antichrist. Yet voter turnout and attention to news and public affairs is up, and most Americans know people who disagree with their views. Around 80 percent endorse levels of tolerance toward ‘out’ groups such as gays, socialists, and atheists. Seventy-eight percent express tolerance of these groups, even if they don’t like them. “My big concern in my otherwise optimistic shtick is there are fewer and fewer forums in which extreme views and bad information can be carefully disputed,” Perrin said. The average sound bite in 1968 was 42.3 seconds; in 2009, it was 5 seconds, he said. The larger issue, according to Perrin, is that civility may not be the right value to embrace. “Incivility is a weapon of the weak, an entry point for people who don’t have a way in,” he said. “These emotions and symbols are the tools real citizens use to approach real problems,” and talk radio, television, the Internet, and the press help to mobilize people, so Perrin recommends engaging with uncivil as well as civil discourse to expand participation. Robin Wagner-Pacifici, the Gil and Frank Mustin Professor of Sociology (left) moderated a discussion that included (left to right) Christopher Edley ’73, William Saletan ’87, and Andrew Perrin ’93. 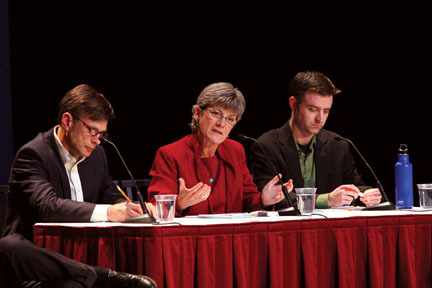 MOBILIZING SMART PEOPLE TO FIND SOLUTIONS TO PRESSING ENVIRONMENTAL problems was the main theme of the second panel discussion, “Sustainable Living,” moderated by Carr Everbach, professor of engineering and co-chair of Swarthmore’s Sustainability Committee. 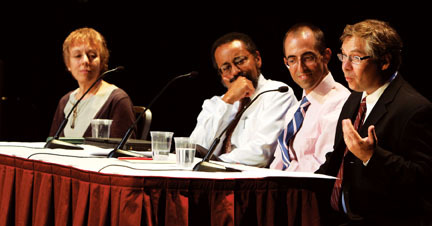 “When I was at Swarthmore in the late 1970s, there was an anti-business bias,” recalled Laszlo, “as if those who went to business school had not quite made it as compared to those who went on to more scholarly pursuits.” But today, new market forces are pushing “green” and social responsibility into business because it’s the smart thing to do. Laszlo said future leaders will need a breadth of knowledge not typical of today’s business leaders, and that Swarthmore should do more to help students find their path to business school after graduation. Anne Kapuscinski ’76 agreed with Laszlo that future leaders in sustainability will need a broader knowledge base—as well as new skill sets—to be equipped to lead and guide the transition to environmentally sound, socially just, and economically viable alternatives. The first Sherman Fairchild Distinguished Professor of Sustainability Science at Darthmouth College, she also founded the University of Minnesota’s Institute for Social, Economic, and Ecological Sustainability. “Sustainability studies is an appropriate response from the education world to one of the greatest challenges of our time,” Kapuscinski said, quickly pointing out that students from all disciplines—not just the environmental sciences—are needed. “I don’t think it’s realistic to think we’ll all end up with the same mental models and epistemologies, but we have to understand each other’s differences so we can find overlaps and meeting points, and find solutions to accommodate different ways of thinking.” She said the curriculum has to include training students to lead and facilitate teams of diverse people to define and then implement solutions to sustainability challenges. The alumni panel on sustainability included (left to right) Christopher Laszlo ’80, Anne Kapuscinski ’76, and Matthew St. Clair ’97. It was moderated by Professor of Engineering E. Carr Everbach (not pictured). Matthew St. Clair ’97 is a good example of the kind of leader Kapuscinski described. As the first sustainability manager for the University of California’s Office of the President, he has led sustainability efforts across the 10-campus, UC system for the last six years. 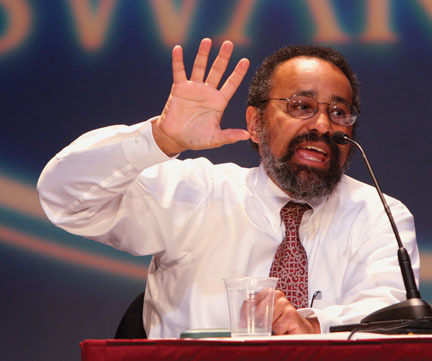 He suggested that Swarthmore needs to support and model sustainability to its students by making environmental values and environmental justice as much of a core Swarthmore value as social justice. He suggested that the College develop a sustainability mission and vision statements to use as a reference point in its strategic planning, consider making sustainability literacy a requirement, and create an Office of Sustainability. Laura Markowitz ’85, a freelance writer based in Tucson, Ariz., also contributed “Let’s Talk About It,” which appears in this issue.